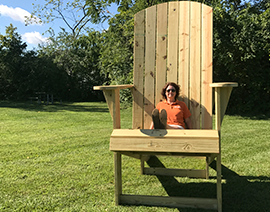 This BIG chair is going on a tour of your 50 parks! (Because sometimes you just need to sit down, relax and take it all in!) The tour started on August 18, 2017 and the first stop was Fence Row Park! The chair will move every few weeks. We won’t announce the new location; YOU WILL! When you find it, post your photo tagged with #BigChairBigBackyard and tell everyone where it is!